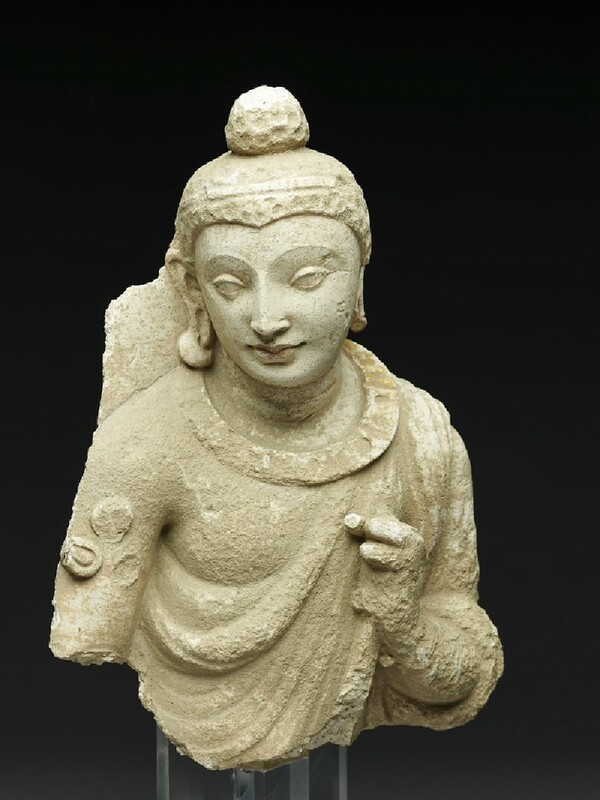 Stucco, on a mud core, was for sculpture at certain sites in Gandhara, as an alternative to stone. The technique was almost certainly imported from Alexandria. Not only Buddhas and Bodhisattvas, but also groups of figures, of which this fine example may have been a part, adorned the base of stūpas at Jaulian and Mora Moradu, satellite monasteries of Taxila, near the present-day Pakistan capital of Islamabad. 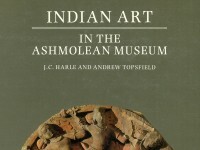 Entire chapels were occupied by sculpture in stucco or unbaked clay at Hadda, near Jalalabad, in Afghanistan. The head of the figure illustrated is a noteworthy example of the skill in handling stucco achieved in Gandhara. Whereas most Gandhara Buddha heads, of which the Museum has several examples, verge on the insipid, the morbidezza with which this head is modelled gives it a real poignancy. The identity of the figure is puzzling however. A glance at the stone Bodhisattva [EAOS.24] will show the same drapery and jewellery; on the other hand, the way in which the hair is treated, which is probably meant to indicate snail-curls, mounting to an uṣṇiṣa is only appropriate for a Buddha. The figure might conceivably be a Buddha paré, i.e. with jewellery and a crown, a common type in later periods; alternatively, the staff (?) held in one hand and the way the head is turned, suggests an attendant figure in a group-depicted without strict attention to iconographic norms.